Coats for Kids is a non-profit serving at risk children by distributing new coats. 93.7 Kiss Country is teaming up with the Fresno County Sheriff’s Foundation for Public Safety or the 2018 Kiss Country Coats for Kids Coat Drive and this year WE NEED YOU more than ever! We are collecting donations of new and gently used coats from the community. Your donations to the Coats for Kids Drive go a long way in keeping children in the Central Valley warm this winter. 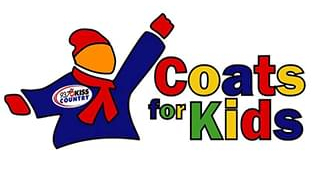 The Kiss Country Coats for Kids Coat-a-thon is joining forces with Toys for Tots and will conclude with a three day coat drive from Friday, December 7th – December 9th, 2018 from 10:00am to 5:00pm each day at the River Park Shopping Center. We will be set up near the round about next to Toys for Tots. Stop by and meet Gnarley Charley, Jody Jo, Erica Pierce and Carp as they take turns collecting your coats in person.